• Addresses an issue where iTunes may become unresponsive when syncing an iPad. • Resolves an issue which may cause syncing photos with iPhone, iPad, or iPod touch to take longer than necessary. • Fixes a problem where video previews on the iTunes Store may skip while playing. • Addresses other issues that improve stability and performance. 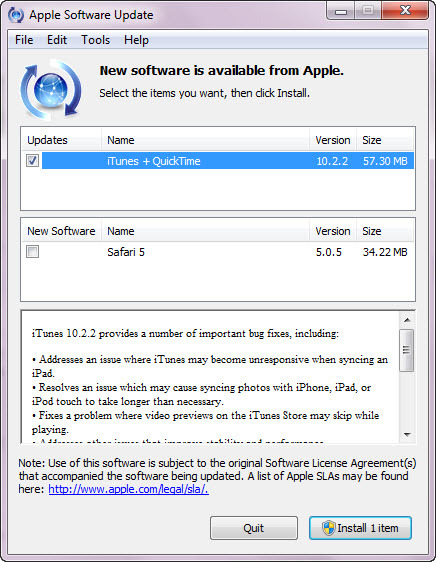 • Sync with your iPhone, iPad, or iPod touch with iOS 4.3. • Improved Home Sharing. Browse and play from your iTunes libraries with Home Sharing on any iPhone, iPad, or iPod touch with iOS 4.3. Jailbreakers and Unlockers should stay away from this update. We will inform you if it safe to Update.